Facts About RatnaGiri,UdayaGiri,LalitaGiri ... .. .
Ratnagiri is located 80 to 85 km from state capital Bhubaneswar in the dist Jajpur. 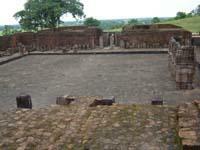 Ratnagiri was a great tantrik centre of Buddhism comparable to that of Nalanda in Bihar. Sofar 3400 listed antiquities from which 220-250 are displayed in the gallery Of Ratnagiri Museum . Buddhist sculptures from this state museum have also got its own identity in different world class museum like china, Belgium etc. 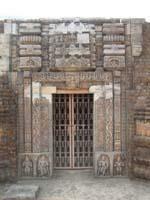 The Archeological museum of Ratnagiri is open on all days from 10am to 5pm except Friday. 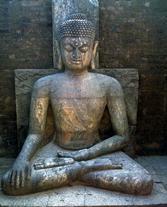 History describes much more about Ratnagiri, but tibetian record counts as one of the worthy record for its existance.However excavation conducted at this side in the year 1958-1961 unveiled many uniqueness of Ratnagiri Buddhist site. Large number of sculptures , inscribed slabs, terracota seals, votive stupas and an elaborate Buddhist monastic establishment came to light during this excavation. This excavation yielded the remains of an impressive stupas sorrounded by a large number of votive stupas of varing dimension, two quadrangular monastery , a single winged huge monastery with beautiful carved door jamb, specious opened courtyard , cells and verandas facing the courtyard and many more. 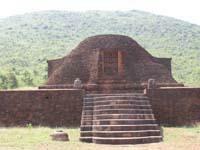 Thing is that the existance of the temple with curvilinear tower is the only one of its kind so far discoverd in orissa. How to reach at the Budhist Monastery triangle. 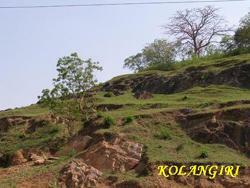 These two unique sites are about 60 to 65km from Cuttack and 80to 85 km from state capital Bhubaneswar. Straight way in NH5A enroute cuttack-Chandikhole -kendrapara, Lalitgiri site is easy to locate out. Similarly enroute to Ratnagiri , Udayagiri site is only one km away from main apporaching road to Ratnagiri. Tourist buses are available. Besides private vehicle is cheaply availble for visiting this site by road. From the impressive remains and large number of sculptures discoverd during excavation , it is clear that the Buddhist establishment of Ratnagiri dating from circa 5th century AD witnessed a phenomenal growth in art, culture , religion and architecture till the 13th century AD. From the excavation it also proved that Ratnagiri was a great tantrik centre of Buddhism comparable to that of Nalanda in Bihar. But a large number of clay sealings , found during excavation, bearing the legend " Shri Ratnagiri Mahavihariya Arya Bhikshu samghasya "have helped in identifying the name of Ratnagiri Monastery. Built on the nothern crest of Ratnagiri hill at Ratnagiri village in Jajpur district of Orissa state , Ratnagiri archaeological museum is considered as one of the unique and important site museum of archaeological survey of India. Having three terraced magnificent building , this Museum was compledte in the year of 1990 and started functioning in 15th august in 1998 . Sofar 3400 listed antiquities from which 220-250 are displayed in the gallery. Amazing panoramic view of the land scape around the museum and well studded and maintained building here attracts a large number of tourists from oveseas also. Buddhist sculptures from this state museum have also got its own identity in different world class museum like china, Belgium etc. Every year besides regular indian tourists, about 2000 foreign tourists are turning up for a glance to Ratnagiri. Soon good accomodation will available for the tourist and constructions of this project is in full swing . 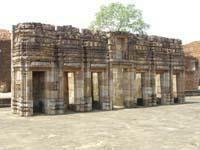 But tourists staying either at Bhubaneswar or cuttack can easily complete their tours before sunset to this site. Visiting hours,Fees and Spots around. This Archeological museum is open onall days from 10am to 5pm except Friday .Entry fees to museum for Indian tourist isRs 2 and for foreign tourist 2$ .Free entry for childrenbelow the age of 15years. Like Ratnagiri,both Udayagiri and lalitgiri are also enriched with typical engraved buddhist monuments and ancient sculptures. A number of antiquities including stone cultural peices , monolithic votive stupas, terracotta seals and sealings , bronze objects , coins, glass bangle items are also defines the gone era of Buddhist monastery fo these two sites. Remains monuments from these two sites has much similarity with Ratnagiri monuments . 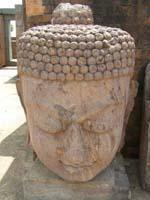 These two Buddhist monastery are believe to be bulilt in the year between 5th century AD to 13th century AD. 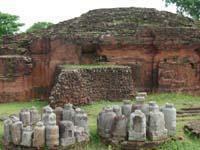 Engraved Stupas and huge sculptures of here are also identical designs with Ratnagiri site. Not only historically and monumentally enriched, site of Udayagiri and lalaitgiri also have interesting tells behind. It is believe that there is a deepwell at Udayagiri monastery which never goes dry even in hot summer. This was consturucted during those days when use of rope for lifting buckets of water was not known to anybody. To meet the water lifting solutins a number of stairs were stretched down deep to the well and it is still existing there.Similarly interesting folk tells are also there for Lalaitgiri . Suitable accomodation is available for limited tourists at Udayagiri site only . Accomodation for tourists at Ratnagiri is under constructions. But tourists have better options to make their trip form cuttack or Bhubaneswar itself.